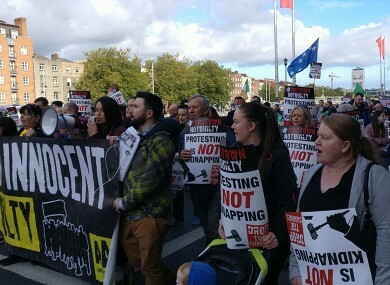 AROUND 200 PEOPLE gathered in Dublin today to protest against a guilty verdict handed down yesterday to a teenage boy. The 17-year-old was convicted of the false imprisonment of then Tánaiste Joan Burton, who was allegedly trapped in her car for two hours during the protest in Jobstown. The teenager, who was 15 at the time, had denied the charges and was spared a criminal record in the case. ‘Protesting is not kidnapping’ posters were handed out, and some people had travelled from as far as Offaly to join in the protest. Anti-Austerity Alliance TD Paul Murphy told TheJournal.ie that the verdict set a ‘dangerous precedent’, and ‘lowered the bar’ of what false imprisonment meant. He also said that the verdict was worrying for those who go on strike, and that the aim of the protest was to mobilise people. “We’re looking to get the trade unions on board and organise a conference and international events. If this was happening anywhere else in the world, we’d be saying that’s mad. The protest began at 1pm at the Central Bank on Dame Street making its way towards the Children’s Court. Last night the Anti-Austerity Alliance put a call-out on their Facebook page for “those who favour civil liberties” to mobilise to defend their right to protest at the ‘Rally for Justice‘. There were criticisms of the verdict yesterday, with the Anti-Austerity Alliance describing the decision as setting “a very dangerous precedent for civil liberties in Ireland”. The verdict, rather than the sentence, is the key issue. It has set a very low threshold by which ‘false imprisonment’ can be proved. In his summing up the judge suggested that one incident that proved the state’s case was when the young man momentarily stood in front of Joan Burton to ask her to answer a question. Another was the fact that he chanted ‘No way, we won’t pay’ and that he encouraged others to sit down. Comments have been disabled as legal proceedings are ongoing. Email “Hundreds gather in Dublin to protest Jobstown teen's guilty verdict”. Feedback on “Hundreds gather in Dublin to protest Jobstown teen's guilty verdict”.